The Interplay Window is a great tool to access content easily and efficiently in an Interplay environment. Many of you may use it in your daily edits to check-in and check-out items from your database, but do you actually personalize it like you do your keyboard or timeline? If not you should. As you will see below, the Interplay Window has many options you probably aren’t aware of. A box will open allowing you to choose what Avid assets you wish to see and which ones you don’t. For instance, you may not want to see all the render files. Or, if an editor checked-in a bin with just a sequence in it, you would see all the master clips, subclips and renders associated in that timeline. To combat this, turn off “Show reference clips”. Customizing this display will make looking through the different folders much more manageable. After you’ve configured you layout, be sure to save it. You can save as many layouts as you wish. The Interplay Window layout is different from the layout you save for your bins and timeline in the editor. Editor layouts are saved on the local drive of the editing workstation. The Interplay Window layout is tied to your Interplay login and stored in the Interplay database. As long as you log in as the same user on a different machine, the Interplay Window display will retain your custom settings. This will open a window showing you every location you will find a copy of that clip. Use this to snap to the chosen location and review other items that may be found in the project. Have you ever look at the headframe in the Interplay Window and wish you could change it to something else? Well, you can. Just drag a clip into your local editor bin. Change your view to the Frame tab. Play the clip in your bin and to find the frame of video you want to use. Then, right click on the clip and select “Check in to Interplay”. Now when you refresh your view in the Interplay Window the headframe will be updated. So go ahead, try it out! Two weeks ago I was fortunate enough to attend an editing workshop with double Emmy award winning editor Kris Trexler where we looked at how he cuts the genre he’s most known for namely television comedy. Suffice to say I got a great deal from the two days he spent with us some of which I want to share with you today. But beyond that it got me to thinking... we may not all have Emmys, Oscars etc, which Kris himself says was a lot about being in the right place at the right time, but we do have hard earned experience on particular genres that surely is more valuable than any piece of silverware… so what about if we shared that? There are many generic courses and workshops out there but in today’s fast paced high demand world we don’t have the time to plough through those copious materials to get to the 5% we actually need for our own projects. So with your permission here is what I would like to do... Let’s start creating our own volumes of wisdom genre by genre. The Avid community encompasses creative talents from around the world working on all sorts of programming be it for film, TV or other forms of media delivery. We each have faced and met different challenges either from a creative or workflow perspective the solution of which, while unique to us, could be of immense value to others in similar circumstances. So what words of wisdom would you share? I can start the ball rolling with two, one of Kris’s and one of mine. And from me on editing in general: - Be very aware of when an actor looks at something because it effects what you can show next especially if he/she looks quickly. I think this comes from thousands of years of not wanting our throats ripped out by wild animals in the jungle but when we see someone look somewhere, especially quickly, we want to know what they are looking at just in case its said wild animal. If your audience sees the eyes move they want to see what’s being looked at and if that desire is not satisfied they suffer which in terms of your edit breaks the dramatic flow. So watch the eyes. Now I know I said specific genres but if you do think you have an overarching gem of wisdom we would love to collect those too. So please get writing. Send us your name, the genre, the insight(s) you wish to share down and any relevant details and let’s see if we can’t help each other to all collectively raise our games... And maybe one day be the right editor in the right place too. The ClipDeko option enables a Deko user to record, import, and play digital video clips, with or without key, and provides tools for the user to edit, loop, trim, and browse these clips. With the advent of Avid Deko ClipDeko option v 5.0 easy transition between multiple clip databases utilizing different video standards is provided. This document explains how to create new or multiple databases and how the databases are managed within the Deko system. There are two types of clip databases in Deko: Standard clips and Power Clips. Standard clips are full screen, or full resolution, clips. Power Clips (Deko3000 only) are smaller-sized clips, such as ‘moving headshots.’ Power Clips have their own database separate from the Standard clip database. Both types of databases can be managed as discussed in this document. 1. Copy the media to the E drive, organized in your preferred directory structure. 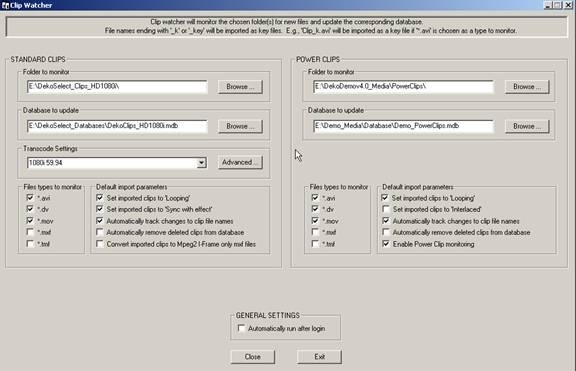 By default, a single clip database is created when the Clip Editor is launched and is named based on the video standard selection within your Deko settings. The new clip database is named automatically and placed in the C:\Dekoxxx\Database directory. If the video standard is set to NTSC, the database is named DekoClips.mdb. If the video standard is set to any other standard except NTSC then Deko automatically assigns the name DekoClips appended by the video standard setting followed by the suffix ‘.mdb’. For example, if the Deko launches in the 1080iHD standard, a new database is automatically created as ‘DekoClips_HD1080i.mdb’ to distinguish it as a separate database from those created using other video standards. Regardless of the type of clip database there may be reasons a user may want to create and manage a new database or multiple databases from those that are automatically created on the ‘C drive’. 2. 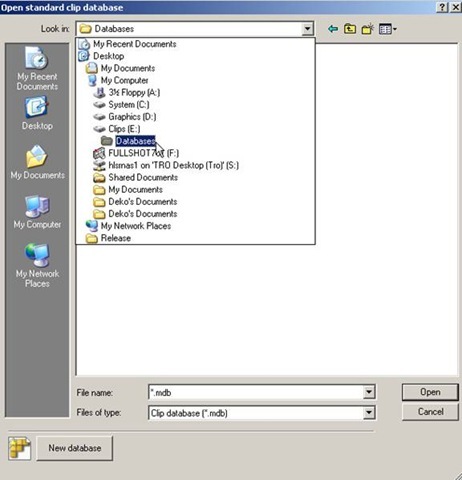 For network share purposes to share the clip database without allowing share privileges on the C drive (IT personnel are reluctant to share items on the C drive.). To create a new database, open the Clip Editor (View>Clip Edit or Ctrl+E). The illustration below shows the clips editor with a loaded clip using a DekoClips_HD1080i.mdb database (the full database path is shown in the Clip Editor window) . 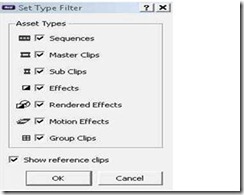 Access a new database by selecting the Clips button in the Clip Editor toolbar. This opens the dialogue box showing the current clip database structure. Select New database, and navigate to the drive and/or directory in which you wish to create the new clip database. The name is assigned automatically with a *.mdb extension. Rename the database by right-clicking the name, retaining the *.mdb extension. After renaming the database name, select Open to launch the Clip Editor window. Conversely, you can accept the assigned name, select the Open button, close the Clip Editor and navigate to Windows Explorer to rename the database name. Import clips as needed once you have completed these steps. 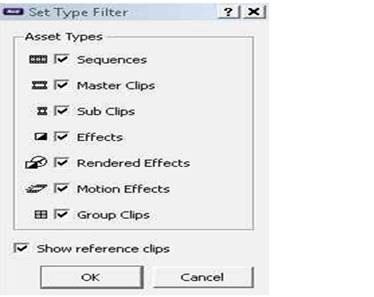 Set this clip database as the default database by selecting Options > Save Settings Now from the main menu. If you are managing multiple Deko units, save time by setting up all clip attribute functions, such as trim points, looping, etc., in one database, then copy the transcoded media (*.mxf formats) and the database to the E drive on the other Deko units. Remember to navigate to the clip database from each Deko Clip Editor and set the working database as the default by Options>Save Settings Now. In copying databases from one unit to another, two file types must be copied for each clip database: *.blil and *.mdb. Avid recommends closing the Deko application while copying databases. If a Deko is on-air during the database copy, the clip editor may not refresh properly. Through my several years working at Avid as a workflow consultant, I have shared experiences with a huge variety of Avid users, from diverse backgrounds, with different goals and ambitions and with varying levels of Avid product knowledge. To my surprise, one of the questions that I get invariably asked is: "in your experience, how have you helped others (other broadcasters, other production facilities, other users) go about addressing this challenge?" In other words, when it comes to implementing new technology, new products, new ways of working, users want to know how it is done elsewhere, how did we, Avid Consultants, go about working out similar conundrums. It makes perfect sense that upgrading or changing technology should be taken up as an opportunity to re-evaluate the production processes, the way “things are done around here”, and to humbly re-assess what needs improving and what needs to be preserved in the new world. And this often happens in close collaboration with Avid Professional Services team: our project delivery team, trainers and workflow consultants. Hence, an unexpected "bonus" that comes with being an Avid Workflow and Training consultant is that we are exposed to all sorts of practical situations both in broadcast and post-production environments. Either for news production, programme-making, high-end editing, material ingest, play out... you name it, we have probably been asked about it! It is a great satisfaction to work together with our users through the technological and workflow challenges that they may find, and agree on and implement a solution that makes everyone (or most!) happy. Not only that, but we know that workflows are organic and they evolve with time and as production needs change, so we are always prepared to review workflows and tweak them if needed. As more and more users quizzed me about my recommendations based on “how others did it”, I gradually realised that such exposure was of huge value. Most end users do not get the chance to walk into another production or broadcast facility and spend time observing how they work, analysing their workflows and optimising them for efficiency. Avid Workflow consultants do! We gradually collect an invaluable set of tools, tips and tricks, which we can then pull out and apply at the relevant moment with whoever we work with next. For example, whilst working at a start-up news channel in India, the library department had never worked with non-linear, digital archive systems. We spent a considerable amount of time exploring what their goals were, and agreeing strategies with the super users, to ensure that they had a reliable and effective archive workflow. This resulted in the creation of several custom metadata fields to their Interplay database (editable via Assist or Access), setting up of daily workflows to sub clip rushes with Assist, consolidate them with NewsCutter and then placing these archive compilations on an auto-archive folder which takes care of the actual archiving process. I have also found that, during workflow discussions and workshops, my customers appreciate a session on “user cases” that describes how we helped broadcaster A, or post facility B tackle a particular workflow challenge. Or simply, to learn about alternative ways of ingesting, transcoding, editing, approving, sound mixing, archiving, etc. Obviously, we are extremely sensitive about how we share such information, and we will always discuss user cases as fully anonymous. The idea here is to learn about the processes and workflows, and not to share any “trade secrets”! As another illustration, I recently worked with a large broadcaster in Central Europe, which produces programmes and promos for their national TV channels. Coming from an Avid MediaManager environment and upgrading to Interplay, they wanted a solution that allowed them to easily distinguish Interplay folders from checked-in MediaComposer projects within the Interplay database. This was easily achieved with a combination of folder colours and pre-fixing folders with special characters. A simple, but very elegant solution that suited all! As you can see, Avid Workflow Consultants cannot only help our users understand more about Avid products and the processes that use those products, but we can also add that “all-round” experience that is so valuable in today’s content production industry. Ask us a workflow question: we have probably answered a similar one before… but, if not, rest assured we will reach out to the rest of the Avid Worldwide Consultancy team to offer you a variety of solutions. It’s in our inquisitive nature! I’m currently sitting in a hotel room in Odense, Denmark whilst visiting the TV news station, TV2 Fyn. Yesterday I was in Holstebro, Denmark to visit TV2 Midt Vest and the day before in Munich for Creation Club, Germany. 9 days, 3 customers, 3 flights, 3 hotels, 1 hire car and thankfully a GPS to find my way around. Last month I spent a great deal of time in Dubai at MBC, where again, thank goodness, the car I was being transported in was fitted with a GPS/SatNav system as well. For those of you who have ever visited, or read about Dubai, you will know it is a constantly changing and developing landscape, whereas Denmark has a long established infrastructure. So, are there any similarities? Well, yes… all four of these customers produce news, sport, trailers, commercials and features. They shoot, edit, produce, transmit and archive video and audio, albeit in different formats and resolutions. They all strive to be the best they can be and to serve their audiences across multiple platforms. And, best of all, they all use Avid products to create, publish and archive their content. All of these customers also made a move from a familiar landscape of Media Manager on Unity to ISIS with Interplay. Not as big a ‘leap’ as they initially made from tape to Avid, but nonetheless they were moving into new territory, and needed a guide who had been there before: enter the Avid Workflow Consultant, or the ‘Avid GPS/SatNav’. Instinct features heavily in the MBC newsroom workflow, voice over is done at the desktop and the majority of the editing is done by the journalists, who in the past would have used Media Browse to prepare edits, which would be finalised by an editor using Avid NewsCutter. Occasionally, Instinct edits are finished off by NewsCutter operators if effects are required, duplicating the sequence in the NewsCutter will break the link with the original iNews story and means that if the journalist were to open their original story from inside Instinct again, that they will not overwrite anything the editor has checked-in. Yesterday, I had an editor capturing video at a central ingest point to a NewsCutter bin. They, of course had to wait until the 30 minute capture was finished until they could begin to edit. They have 2 x NewsCutter Nitris DX systems that they use as capture devices. Pinning the folder and capturing to it, allowed the editor to begin cutting from the ingested tape, as they would from an AirSpeed ingest, frame chase editing. They finished the story earlier than expected because of this and this allowed the news gallery a little more time for a rehearsal before they went live with their new programme using an Interplay workflow. Last night TV2 Fyn went on air with their news programme using a full Interplay workflow. In a day or two we will be deleting media from the ISIS that is no longer needed for news using Interplay Access, so deletion and protection rules are very important. What if a master clip that was captured yesterday is going to be used again tomorrow? What are the rules, and who will protect the media? These decisions need to be made by the customer, with the guidance of a Workflow Consultant from Avid. If a newsroom journalist user creates a new NewsCutter project and bin from the NRCS tool and drags a master clip in to the bin from a project that is about to be deleted, and checks that bin in, it will be automatically permanently reserve the master clip again. Why? Well, the workflow for TV2 Fyn is that we have created a site setting for each machine that ‘points’ every new project created into a subfolder of ‘Projects’ called ‘Projekter’ (Danish for Projects). ‘Projekter’ is permanently reserved, which means they have a similar workflow to the one they had with Media Manager, in that association with a project protects the media, until the project is deleted. We have also created a folder in Interplay called ‘Trash’. When a NewsCutter project has been checked-in and is no longer needed, the deletion cycle is 3 days here at TV2, then the project is cut and pasted into the trash folder, where the reservation is removed from the folder and the project folders and associated media is deleted. Summing up, there are many considerations when designing a workflow with a customer, and for me workflow is not just about how the media gets from camera to screen to archive, that’s what I would call ‘media flow’. Workflow is about people; journalists, editors, designers, anchors, camera operators, librarians, viewers and advertisers. There are always two sides to every project; is this a technology project that involves people, or a people project that involves technology? My view is the latter. Technology may drive the change, but managing that change involves a symbiotic effort between the customer and Avid, this is why having been a customer and operator of Avid products (as well as ‘other’ providers), the Professional Services Workflow Teams can approach and work with customers and understand their needs from a real-life newsroom perspective. Article by Richard Bentley, Avid Professional Services Consultant, EMEA. Located at Channel 4’s offices in Westminster, London, the Red Bee Media Production centre provide post production facilities to the Channel. Red Bee have a mixture of Media Composers, Symphony Nitris, Digital Tape suites and 2 Pro Tools suites, one housing a D-Command and the other a Command/8. Although the significant change ahead for Channel 4 and Red Bee Media Production was the migration of playout from in-house facilities to an offsite facility – a more local challenge was to upgrade their current Avid installation to include an Interplay database and extend the viewing and logging application to production areas located elsewhere in the building. The team were also adopting a new audio workflow – moving sequences seamlessly between the final picture edit and the final audio mix – and back again, with numerous versions to contend with. All using Interplay with a Video Satellite in the dubbing theatre. This required careful workflow planning with their senior operational stakeholders and entailed subsequent user training. For the first time Avid presented a united workflow and training offering with Claire Humphries (EMEA, Training and PSG) providing workflow and training for all things video and Interplay and Andy Baker (formerly of Digidesign) providing workflow and training for Pro Tools 8.0, Media Composer Video Satellite and the Pro Tools/Interplay workflow. Claire and Andy presented a united workflow session to the team which enabled a clear, transparent and efficient workflow to be designed across both departments. Editing stakeholders were encouraged to attend, and vice versa; the dubbing mixers had a say in the final edit preparation of the video workflow. Not only did this engage both craft departments, ensuring that all technical and creative requirements were represented, but the customer was delighted to see Avid working as a team. Formerly, customers saw Digidesign support and training as a totally separate offering to Video workflow consultancy and training. Now the customer sees a One Avid approach helping them to achieve success in their programme making. What is Avid’s ACSR Certification Program? Avid Certified Support Representative (ACSR) Program participants are trained and certified by Avid with the knowledge and skills necessary to perform installations, upgrades, diagnostics, troubleshooting and support in the post, workgroup production or broadcast environment. This multi-certification program is designed to ensure the highest level of technical proficiency with Avid products. The first tier of the ACSR program covers our editing systems. As an Avid Certified Editing Support Representative you will thoroughly understand the technical and operational aspects of Avid Media Composer and Avid Symphony on both the Windows and Macintosh platforms. This certification also offers access to Avid's Senior Escalation Team and connects you directly to the community of certified ACSR Support Representatives worldwide. The second tier of the ACSR program covers our storage systems. As an Avid Certified Storage Support Representative you will thoroughly understand how to install and maintain the technical, operational, and administrative aspects of either or both of Avid's Unity MediaNetwork and Unity ISIS shared storage systems. The third tier of the ACSR program covers our Interplay management system. Once you have achieved this level of certification you are recognized as an Elite member of the Certified Support Representatives. As an Avid Certified Elite Support Representatives you will thoroughly understand how to install and maintain technical, operational, and administrative aspects of Avid's editing systems, storage systems and the Avid Interplay management system. What follows is a diagram outlining the ACSR paths and some of the main course pre-requisites. The catch phrase used to be "Change your mind without losing it" back in the day. That particular time was 1991, the year I first started with Avid as the 4th Customer Support Representative and then the first full time Instructor for Avid Technology. In that time I traveled the country and more than a dozen countries training editors on the Media Composer. In 1998, I went to IBM as a training manager giving me broader exposure to the education business and how it can be run on a large scale while still maintaining product quality and measured results. Fast forward to 2008. Avid is enveloped in New Thinking, new management and unification across the corporate brands. We have harnessed the power of our counterparts around the globe and are working to bring modern training methods and concepts to Avid customers in a consistent and intelligent fashion. During this time of evolution and cohesion as a company, it makes perfect sense to align the training organization in the same way, and this will be the first time the company has had a truly worldwide training organization. Recently I was given the opportunity to return and I jumped at it, as I enjoy fostering the fire of education through new challenges and approaches. And what opportunity better than to return to the company I helped to grow globally and to take public, now with the largest and most talented customer base in the industry. Just look at those who walk away with recognition at each Clio, Emmy, Grammy and Academy Award presentation. Our team is now aligned with Avid Worldwide Training on a cross-brand, One Avid organization led by Carolyn Lightner. As the Manager for the Americas Training Delivery Team, I work with driven individuals who collectively have an amazing amount of talent and industry knowledge that we would like to share, and this forum is one of many vehicles where we would like to offer some of our knowledge to you on a global basis. Collectively, our instructors have years of broadcast experience in various aspects of production, film and post-production experience, and are skilled in creative arts, technology and the sciences. My delivery management counterparts in APAC and EMEA, Anna Lockwood and Jason Plews respectively, will also bring their team's skills and experience to this forum for perspectives on training, equipment and methods from around the planet. We hope that you enjoy and benefit from the entries that will be forth coming, and as always, thank you for your support as Avid customers and users! If you are interested in obtaining Avid Certified Support Representative (ACSR) certification, please note the following dates for the pertinent offerings. Recertification dates are also included for those who already hold current certifications which are about to expire. To enroll, contact the Avid Training Coordinator at 800.867.2843 or at trainingservices@avid.com.